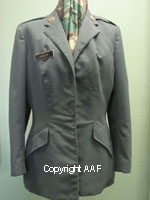 1988 dated, US Army, "Coat, Woman's, Poly/Wool Serge, AG-344 Classic Design," belonging to a Woman's Army Corps. "WAC", Private named "Josey," serving in the 82nd Airborne Division. Buttons not sewn on, but all are included. Transportation Corps. collar disc is on the collar.